You can test any particular message for spam and see the spam test report. To test a message you need to select it and click "Test Message" button on Spam Reader toolbar or menu. When testing is complete you will see the spam test report. 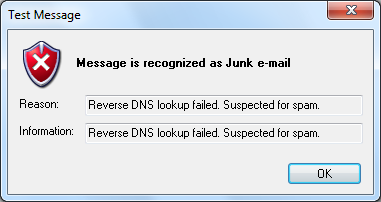 Reason: shows the reason to recognize the message as spam or as legitimate. Information: shows exactly why the above reason was used.